We’ve got your prep covered. Our expert instructors will give you the tools you need to guarantee a better score. Our LiveOnline courses make it possible to get The Princeton Review prep experience from the comfort of your home. Whether you’re aiming for med school, B-school, grad school or law school, our LiveOnline courses fit your schedule and get you the scores you need. Our top-notch teachers know the exams inside and out. Our exclusive test-taking strategies, online materials and realistic practice exams will give you an edge and ensure you reach your goals. With LiveOnline you can prep where and when it’s convenient. As long as you have internet, you can follow along with the lesson and interact with your teacher and classmates in real-time. Rise and shine or burn the midnight oil. Whichever you prefer, LiveOnline has you covered. Ever record an important lecture? We do. You can review the material again until you get it — and it’s archived for safe keeping! 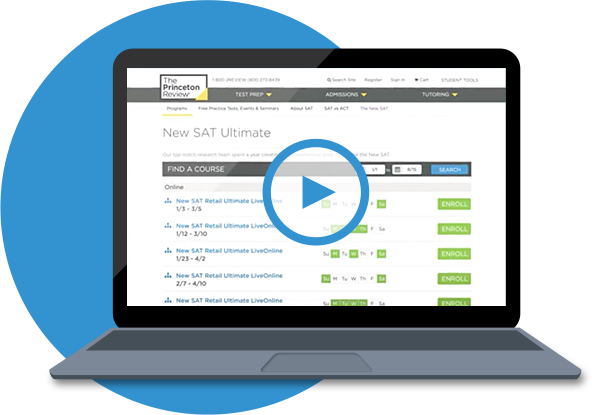 Need the Perfect SAT/ACT Online Prep? No more worrying about transportation or conflicting schedules. You’ll have a front row seat in the classroom right from your living room! Our top-notch teachers know the exams inside and out and will give you the edge you need to reach your goals. 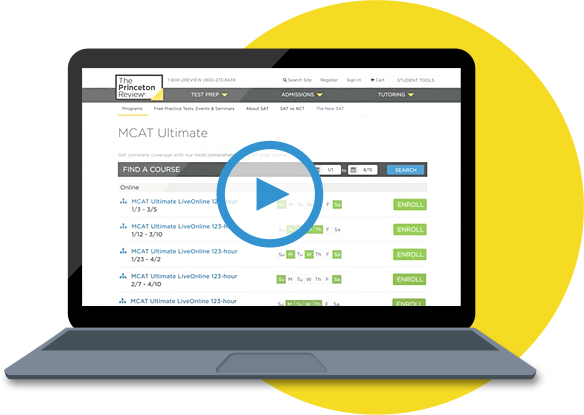 You’ll master our exclusive test-taking strategies and get access to over 150 videos, thousands of practice questions and realistic practice exams on our new student portal. Test prep online where and when it’s convenient. As long as you have internet, you can follow along with the lesson and interact with your teacher and classmates in real-time. Early morning, late night, specific days of the week—LiveOnline has you covered. No choosing between your prep and your favorite after school activity. Have them join you in class or check out what you’re learning with our online dashboard. Every LiveOnline lesson is recorded so you can re-watch and review tough concepts anytime you want. Our prep makes a difference. Students in our SAT and ACT Ultimate courses get a better score by 100 points on the SAT or 3 points on the ACT. I liked the online class atmosphere and how I could easily email the instructor or simply ask questions in class with direct feedback! The Princeton Review taught be not only the material, but the strategies to utilize my knowledge. I can walk into the test with confidence that I can outsmart the SATs traps and tricks. It was nice to get the classroom experience from the comfort of your own home. My class was very charismatic and worked very well with each other. Everyone helped each other out and we all had fun. I feel like the instructors are overall very prepared to teach their subjects and take as much time as needed to answer our questions. The teachers truly care that we understand the material and they want us to do well. I liked the pace and the organization of the course. It was challenging, but I learned a lot. Extremely competent teachers, and I was surprised at the level of interaction that is possible via online classes. The practice passages help a lot as well as the practice tests. Teachers were outstanding and helpful in guiding us on what we need to know for the MCAT. My teachers focused on the material we need to know for the MCAT and provided ample resources for us to develop skills to succeed. You guys prepare us in every aspect. I feel much more comfortable about taking the test now that I have the right knowledge and test taking skills.